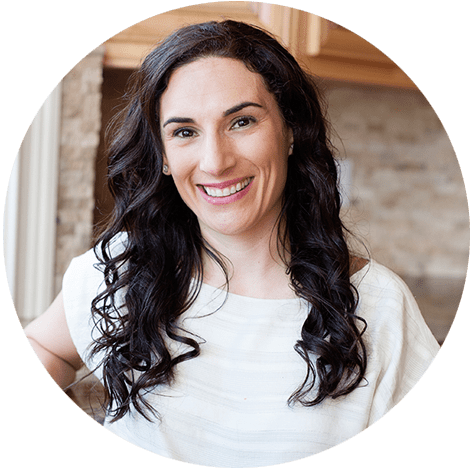 Because we know a lot goes into keeping families moving, MOMables is always sharing ways to simplify things on the “feeding your family” front. Just as you will find prep-ahead tips in the weekly plans, today we’re sharing a prep-ahead tip for how you can cook ground beef in a crock-pot, for all of your meals for the week, at once. Cook once and eliminate a step later on in the week when you’re making meals. If you can eliminate one of the more time-consuming steps like this, your dinner prep moves a lot faster, which gets dinner on the table faster and leaves more time for you to cross other things off that never-ending mommy list. Don’t have a crockpot yet, or need a new one? Here’s the one I use for cooking ground beef. All you do is add up to 3 pounds of ground beef to your crock-pot (I have done as many as 5 lbs. at one time). Break up the beef and add ¼ cup water (per pound of beef). Turn your crock-pot on and cook on HIGH for 2-3 hours or LOW for 4-6 hours. Cooking time will vary depending on how many pounds of beef you are cooking. During the cooking process, I stir the meat mixture occasionally to help the meat cook evenly. Once your meat has fully cooked, drain off the grease. I then divide the meat out and store in plastic bags in the refrigerator. Then later on in the week, when I need to add it to a casserole, sauce, etc., I just pull it out of the refrigerator and add it along with the other ingredients. It is a huge time saver. Not to mention, it means dirtying one less pan that night! 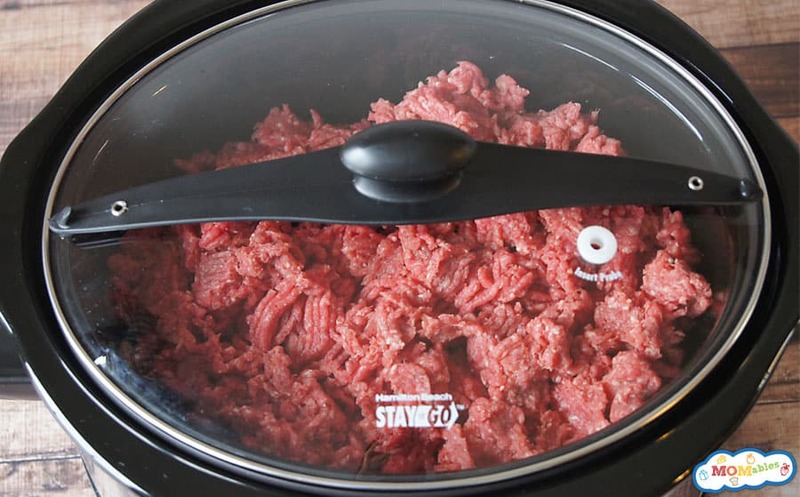 Draining the fat from ground beef is simple when you are talking about a small pan, but when it comes to a crockpot full of 5 pounds of meat it’s a little bit more daunting. Pour out the liquid from the top of your crockpot, and if needed you can use a slotted spoon to remove the meat from the crockpot without getting any excess grease in your freezer containers. There are so many delicious lunch and dinner ideas to make with ground beef. Looking for more? 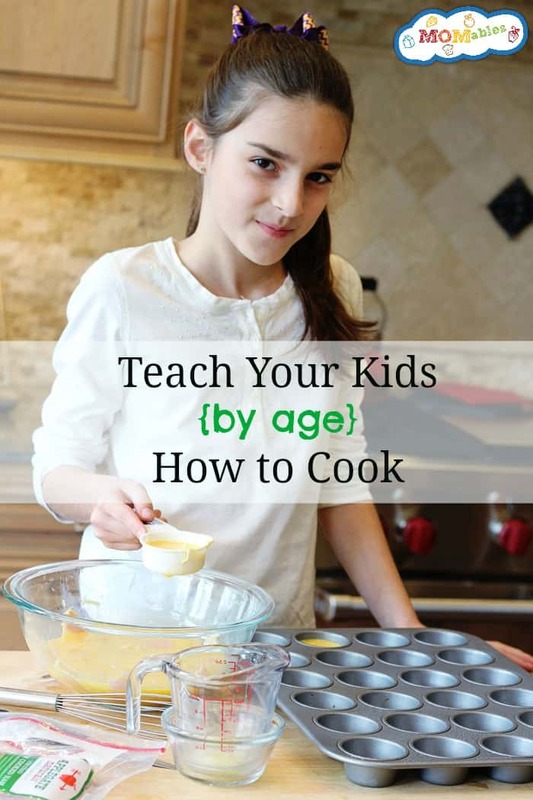 Check out this post for dinner ideas for kids. I don’t exactly know what it is about the onset of colder weather that makes me feel compelled to start stocking my freezer with meals, but it happens every year around this time. If this happens to you as well, this method for cooking ground beef in a crockpot is also great to do and instead of using the beef right away, you can stock your freezer with the cooked beef. I use this method to cook up a bunch of ground beef and then freeze the cooked meat in a freezer safe plastic bag. Then on days when I am in need of a quick meal, I can pull out the beef, let it thaw, and add it to any dish (spaghetti sauce, taco meat, etc). A quick and easy way to cook ground beef that requires very little work…count me in! Thanks to the slow cooker we can cook ground beef without grease splatters or watching the stove. Once cooked the beef it’s perfect for tacos, nachos, spaghetti, and other family favorite recipes. Place the ground beef into the bottom of a 6-quart slow cooker. Break up the meat with a large spoon and add the water. Cover and cook on high for 2 to 3 hours or low for 4 to 6 hours. Once the beef is cooked through, carefully pour the excess grease and liquid from the slow cooker dish. Using a slotted spoon, transfer the meat into airtight containers. Keep the cooked beef refrigerated and use within 3 days. To freeze, seal the desired amount in an airtight container and freeze for up to 2 months. Can you do ground sausage the same way?? I’ve done the ground beef & LOVE doing it this way soooooo much!!! What if I was using 5lbs of refrigerated beef, how long would I cook it if I was using low? 5lbs will take about 12 hours on low, stirring throughout. Thank you for this tip! I’m living in a hotel for work for a few months and trying to get creative with cooking is a challenge. I understand it is a challenge cuz all I have is my crockpot and I have been trying to figure out what I can cook and I have been trying creative ways to cook everything. Thanks for this tip! I don’t always want to heat up the kitchen in the summer, and in the winter, I get tired of standing over the stove for so long! But I love to cook up a big batch of ground beef seasoned with salt pepper and pepper and some chopped onions. It is so handy right out of the fridge or freezer! you can do that, just make sure you continue to come in to break up the meat pieces throughout. Enjoy. how long will the cooked meat be good for in the refrigerator/freezer? In the freezer, about 1-2 months. I don’t keep it in the fridge for no more than 1 week, preferably around 4-5 days. How long did the 5lb take and what setting? 5 pounds took 6 hours on high, stirring a few times every 1-2hours to break up the beef. I had success with 5 lbs last night – it took 4.5 hours on high (although I had it set for 6 just in case). I stirred every hour or so. That;s a first, 5lbs! wow. So glad it could help you prep food ahead of time. I want to make tacos from the ground beef. When should I add the seasoning? When I start the beef or after its all cooked? Hi Shannon! You can add the seasonings when you start the beef. This might sound weird but I have been cooking 1.3lbs of frozen ground beef on high for 4 hours and If I look really closely it looks as if the meat is still pink but I can’t tell if it’s from the taco seasoning or if it’s not cooked all the way, and idea on how to tell? Hi Jacquie! I’d always be safe when it comes to cooking meat, so maybe try breaking it up with a spoon and looking at the inside of the meat. Hope it works out for you! Me too! Just what I was looking for… I’m going to try it right now. The extra mess & cleanup of browning the meat makes me less likely to cook. Someone mentioned that the end result might not look as good as browning in a skillet, but after the ground beef is mixed into chili or spaghetti sauce it wouldn’t show. Happy camper here… It was quick & easy. Tastes great in chili. I didn’t think it looked very different from skillet-browned beef. I added Jimmy Dean sausage (frozen) to my (frozen) hamburger and it turned out great! I also added onions and peppers. Made chili with some… making Spaghetti tonight and Taco’s another night. Great idea!! So to drain do I just tip the crockpot over and pour the excess liquid into the sink? pretty much. Or, use a ladle spoon to remove beef. I use a spider (a spoon strainer) to ladle a cup or so of the cooked burger into a wire mesh strainer placed over a deep narrow bowl (it’s like a giant Pyrex measuring cup). I then use a potato masher to squeeze the excess fat/water through the strainer and into the bowl. I dump e contents left in the strainer into a giant mixing bowl. I repeat this procedure until most of the burger is removed from the crockpot. Using oven mitts, I then pour the remaining contents of the crock into the strainer and transfer the last little bit to the last bowl. Once the fat/water in my big measuring cup/bowl has cooled, i pour it into a large freezer Baggie and discard in the trash. Do not pour the liquid down your sink, because it can cause the pipes to clog. Can you do this with frozen ground beef or does it have to be defrosted? Sure, but it will take longer and you’ll need to break it up once it thaws. googled this while in the process of trying it for the first time…… But I used chicken broth instead of water. Will that work? Is it possible to use this method for frozen ground beef? I often will throw frozen chicken thighs in the crock pot and it’s the best for casseroles, I can never remember to defrost my meats before the day I need them. I love this idea sooooo much! I love using my crockpot since I live in FL and I do anything to keep the heat to a minimum. I just remembered this too. I want to make a casserole tomorrow night but didn’t want to have to cook the meat, then cook the casserole. I’m gonna through the meat in my crock pot to cook tonight before I go to bed. Then tomorrow all I’ll have to do is prep & steam my veggies, throw the meat in with a can of tomatoes and I’m all set! Thanks again!!!!!! great way of saving time!! I used my 7qt crock pot and browned 6.75lbs of ground turkey using this method. There was a lot of liquid, so after it was cooked, I drained it well and put it back in the crock pot and let it cook for a little while longer, this gave it some of that browned/seared look. It worked awesomely well. I used some for sloppy joes, we’ll be having tacos this week and the rest will go into the freezer. Thank you! But how does it look? I haven’t found that ground beef looks very appetizing if I don’t cook it first before making something that calls for it in the crock pot. I like that browner, seared look. It looks like cooked ground beef. Seasoning is key as well. Do you think this method would work for ground turkey? I’ve never tried it Michelle but my crockpot expert neighbor just texted me: YES! 3-4 hours on medium-low setting stirring a few times with seasoning. Thank You! I may have to try it.